LAHORE: Jamatud Dawa (JuD) Ameer Hafiz Muhammad Saeed on Tuesday while terming Pakistan an ideological state said that the country’s curriculum should not be secular. Addressing an educational seminar here, he said some external powers had targeted Pakistan and they were promoting atheism and secularism in the homeland through the educational curriculum. “Attempts are being made to fade away the concept of religion in the country,” he said. He urged teachers to train the children nobly and said education had not been given much importance in the country. “Muslims, in the history, have embarked upon glorious achievements. Skills, education as well as Islamic knowledge, all were taught together. A person who used to seek the knowledge of medicine also used to read Quran with understanding. In the subcontinent, the British separated the religion from education, thereby promoting secularism,” he said. He also said that it was the British who promoted the idea that religion had nothing to do with politics or the economic systems. He vowed that education was a fundamental right of every human being and it was the responsibility of the government to establish as many institutes as required. “In Saudi Arabia, there is no concept of madrassa or school. There is one educational system. The entire curriculum is in Arabic. 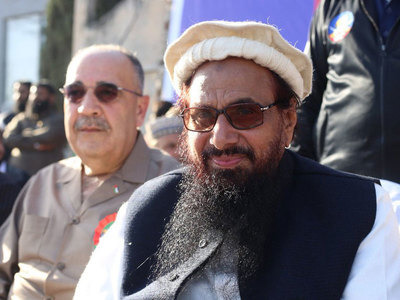 Their curriculum has a great role in maintaining peace in the country,” said the JuD Ameer. “We should seek guidance from the life of our beloved Prophet (PBUH) in every matter of life,” he asserted. A large number of teachers from various cities attended the event.